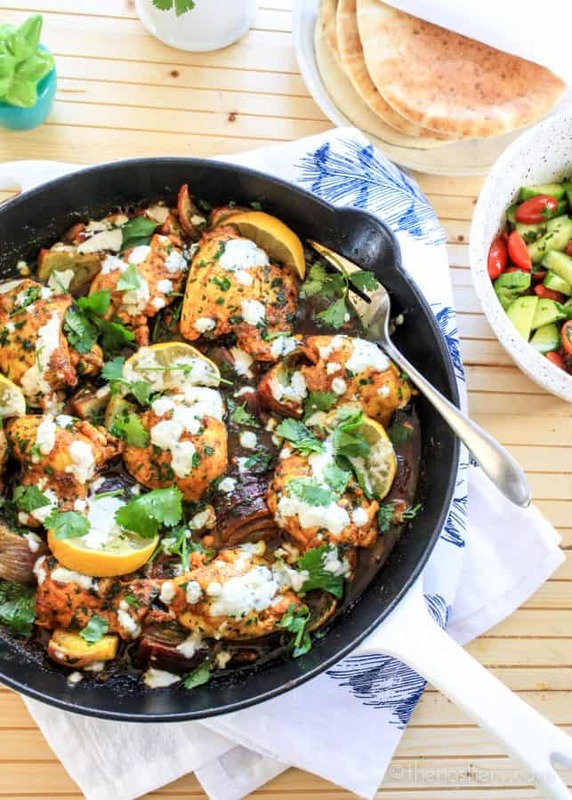 Chicken Shawarma Skillet | It tastes like chicken is something people say when describing something simple. I think it’s used because when it comes to food it’s something everyone can relate to. Everyone has tried chicken at some point in their life. And although some might even consider chicken boring I have never met someone who doesn’t like chicken. Shawarma is a dish that could never be described as boring. 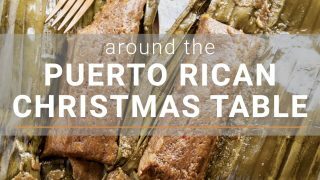 This is adaptation is easy to make on a weeknight and pack full of so many spices are aromatics it’s a festival of flavor. Let’s talk about shawarma. I like to describe shawarma as a Mediterranean street food flavor bomb. Meats are seasoned with a mixture of spices and then placed on a spit and slowly roasted for as long as a day. Shawarma can be made with either lamb, beef, or chicken. It’s typically served with pita bread, cucumber, tomato, eggplant, hummus, or tabbouleh. When I tried shawarma for the first time I may have lost my mind a bit. It was so full of complex flavor. I could taste cumin, coriander, and hints of cinnamon. It was so good I licked my turmeric stained fingers clean. I knew that I had to recreate this at home. I went on a hunt for a recipe and found one in NYT Cooking that I sensed would be perfect. 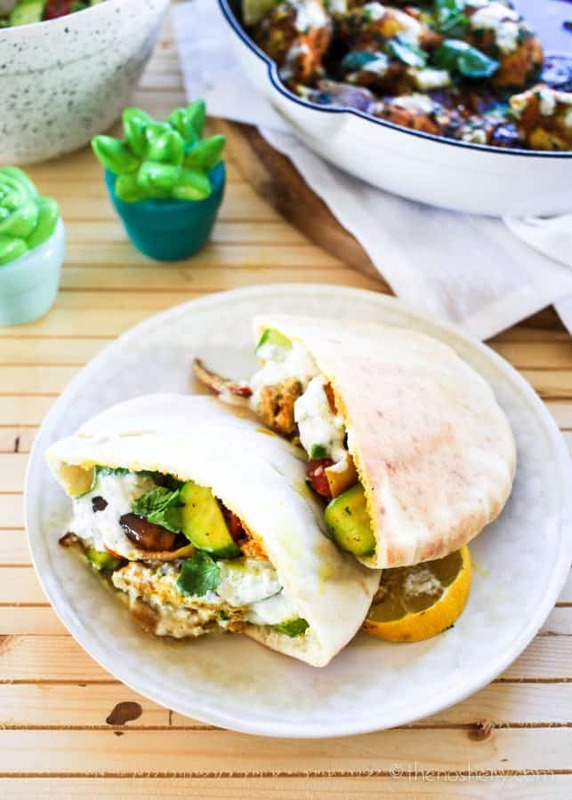 This adaptation is a baked shawarma that can be made any day of the week. Season the chicken in the morning or when meal prepping and let it marinade. When it’s time for dinner bake it in the oven and serve with all of your favorite fixings. I love to eat mine in a pita pocket with tomato, cucumber, parsley, and tzatziki yogurt sauce. But you can enjoy it any way you like. Lately, I am obsessed with chicken skillets. I love them because they are easy to prepare and only require one skillet. 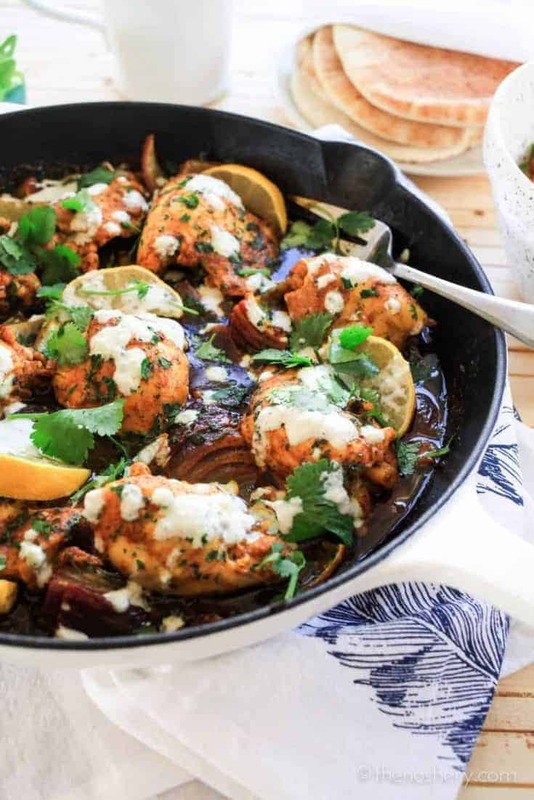 If you are looking for something with potatoes you should try this chicken skillet with mushrooms and potatoes. 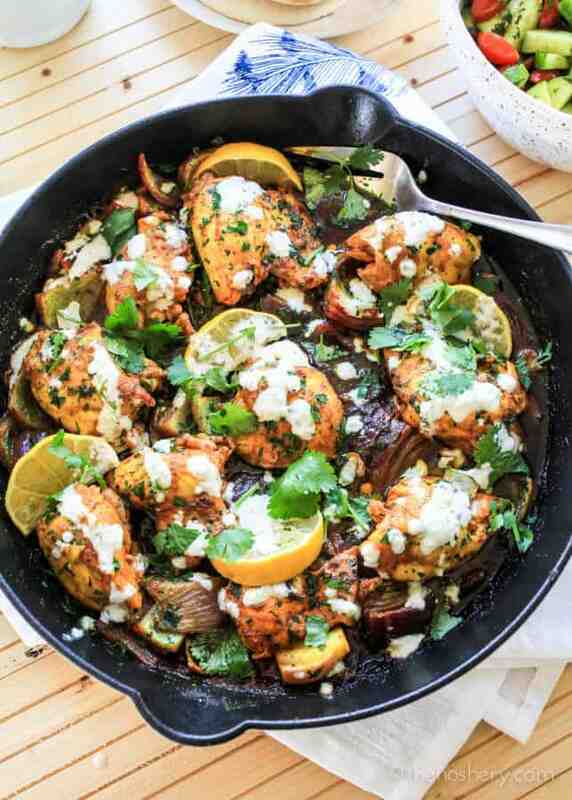 If you want something light and healthy this easy italian chicken skillet will do the trick. Finally, if you are craving a killer chicken salad you must try this pollo asado massaged kale salad. Really when it comes to chicken the possibilities are endless! Visit my entire chicken recipe collection for more inspiration and chicken will never be boring again! 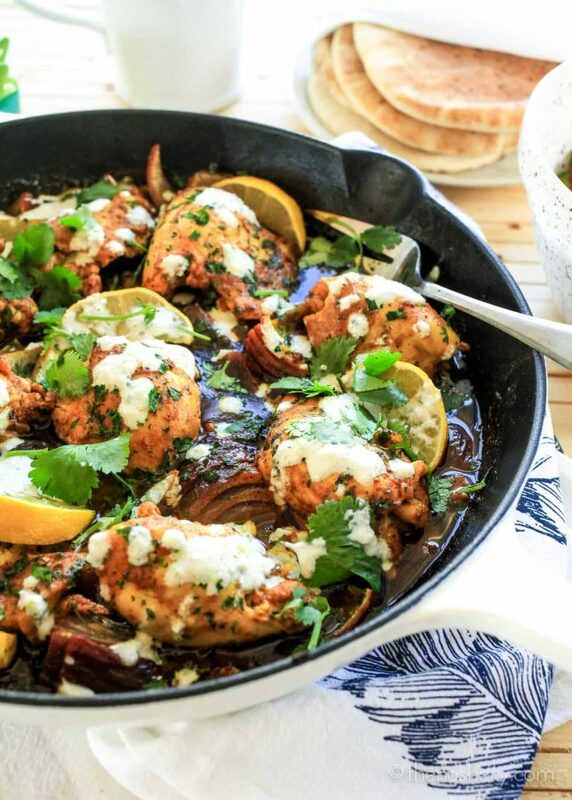 This baked chicken shawarma skillet is an adaptation of the popular middle eastern street food. This flavor bomb is the perfect weeknight meal. In a large bowl combine lemon juice, 1/2 cup olive oil, garlic, tahini sauce, salt, pepper, cumin, paprika, turmeric, coriander, cinnamon and red pepper flakes, whisk until well combined. Add the chicken and toss to evenly coat. Cover refrigerate for at least 1 hour and up to overnight. Heat oven to 425 degrees. Heat an oven-safe skillet (like cast iron) over medium-high heat. Remove chicken from marinade and set aside on a plate. Pour marinade into the skillet and cook for 3 minutes. Add the quartered onion to the skillet and toss once to combine. Place chicken on top of the onions and transfer to the oven. Bake in the oven until browned, crisp at the edges and cooked through, about 30 to 40 minutes. Remove from the oven, allow to rest 2 minutes, then slice. Garnish with chopped parsley and lemon wedges. Serve with pita bread, tomato, cucumbers, and tzatziki. This was so delicious! Will definitely make this again! I lived in Waterloo region where there”s half a million people, tons of immigrants and yet only a handful of shawarma places. Toronto has tons of shawarma places and so does ottawa. The rest of ontario doesnt have very many. Definitely my kind of meal. I am hungry just thinking about it! I just made this tonight and it was amazing! So flavorful and my kids and husband loved it! This is better shawarma than I have eaten at some middle eastern restaurants! The sauce is delicious and has the perfect balance of flavors. Thanks so much for sharing this recipe.I will be making this over and over again! I just made the marinade, and it smells wonderful! I’ll cook the chicken tonight but I can already tell this is going to be delicious!